In honor of our third anniversary, Asymptote’s Boston crew hosted “Translation in the Academy,” a conversation about the intersection of the growth of “translation studies” programs in universities and the praxis of professional translators. The panel was convened by our own contributing editor Ellen Elias-Bursac (along with plenty of help from Nina Beguš, Daniel Goulden, and Alex Sham!). On the academic, translation-in-theory side of the ring: Karen Thornber, professor and current chair of Harvard University’s Department of Comparative Literature, and Edwin Gentzler, Director of the Translation Center at University of Massachusetts-Amherst. Representing translation in practice: Lloyd Schwartz, poet, active translator of Portuguese, and English professor at the University of Massachusetts-Boston, and Vivek Narayanan, poet and translator of Tamil. 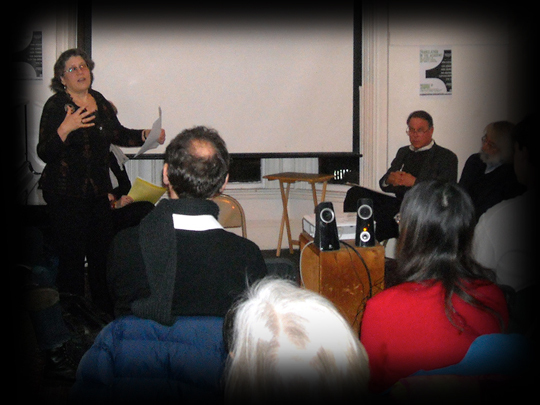 The panel was held at the Outpost 186 artspace in Cambridge, and true to Asymptote form, it was a room full of translators: of Japanese, of German, of Hebrew, and of Spanish, to name only a few of the languages represented in the diverse audience.